Katharine Smyth adored her father, even as he sabotaged his relationships and refused to address his alcoholism. He used his charisma and adoration for his daughter to ignore the impact of his addiction and cancer on his family and the way he baited and fought with his wife. And so Katharine loved her difficult father in life and mourned him after he died. In her grief, she looked to a book about complicated relationships that was written after the loss of a parent: Virginia Woolf's To The Lighthouse. All the Lives We Ever Lived is a slow, meandering read. 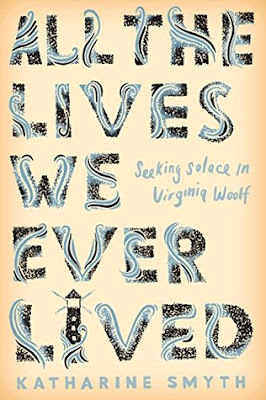 Smyth writes lovely prose, but the reader has to be content to meander along with her as she carefully finds the parallels between her relationship with her father and the relationships between Virginia Woolf's characters. There are moments when you may have to push yourself to keep reading because there is not a great narrative immediacy, but this is a seamless blend of family memoir and literary criticism. Katharine Smyth has done a lovely job of writing about what it means to look for answers and for solace. She writes about the limits of truly knowing someone, even a person you have lived with and loved for years. She explores the different ways we grieve, when someone dies and for all the ways our lives could have been different. This is the kind of book that will make you think about your own family, what it means to love someone who makes bad choices, and the books that carry us through our moments of tragedy.